We hoped more than knew that BREATH OF BLIGHTY and COSMIC DANCER were fit enough for their seasonal debuts after five months off. They have just done plenty of work at home, without going away to work on the grass or at Wolverhampton. BREATH OF BLIGHTY is a rounded, stocky fellow and it was always possible that he would benefit from this run which he did. 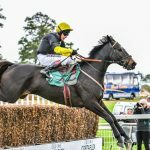 However we are very pleased with the way he stayed on form the last in finishing fourth, beaten under six lengths by the much fitter winner. He jumped really well and rallied which was great to witness. Tom O’Brien was very pleased with him and thinks he’ll be sharper now should win next time. 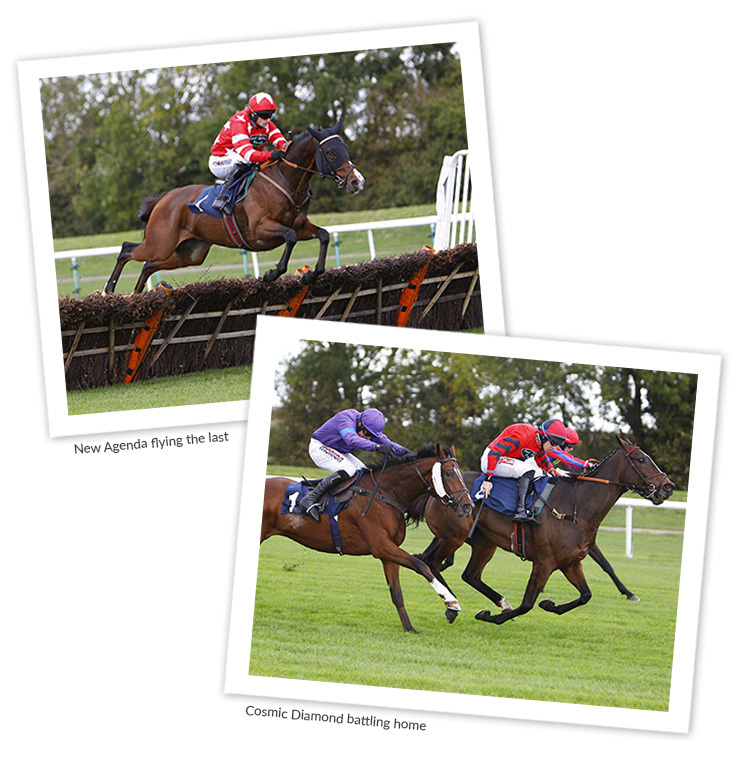 NEW AGENDA was a pleasure to watch as he becomes more relaxed in his races. He settled well in front and then quickened smoothly into the straight. He jumped really well and won in a good time, nearly 3sec. faster than standard. I’m so pleased with the way he is ‘chilling’ through his races now and am also so excited about his chasing prospects in time. What a phenomenal relief to finally perform alchemy and turn COSMIC DIAMOND into a winner! I have kept faith with this filly and made many excuses on her behalf and sincerely thank her owners, the stoically supportive Economic Security Partnership for hanging on in there! It was a real thrill that so many were present and also a sadness that others were absent. Gavin Sheehan gave this filly a very special ride and he is due plenty of credit for the work and thought he has put into ‘Lucy’. Let us hope that she can keep improving from here. No doubt the bar-staff noted that The Trainer was not glugging it down with his usual enthusiasm, but this was not due to him being in a state of shock after this lovely ‘double’! No, with Jerry’s retirement he had the duty of second horsebox-driver today! At this time of year the bloodstock world is speeding through the yearling sales. It is like a carousel spinning around from sale-ground to sale-ground, with little hope of dismounting until it slows to halt at Deauville in December. The Consignors, Bloodstock and Shipping agents, the lads and lasses showing the horses all live a ‘travellers existence’ working at each and every sale. It is a highly competitive scene but a remarkably amicable one until somebody over-steps the invisible line of decent behaviour by plotting to pinch or grabbing other peoples’ business! 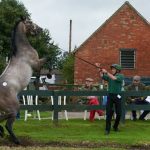 While the ‘circus’ was camped under The Big Top in Keeneland, and with others preparing the stage in Fairyhouse, Sophie Webber and I veered off the ‘beaten track’ and attended the “Subasta de Yearlings” at the magnificent Hipodromo La Zarzuela in Madrid. There were sixty yearlings catalogued and we ended up with seven on our ‘short-list’. The only other English/Irish speaking person there was the legendary Con Marnane, who had flown in from the Italian yearling sale, but there was nothing of his type of quality. Sophie and I bought a colt by this year’s Derby winner’s sire, Pour Moi for 18k. 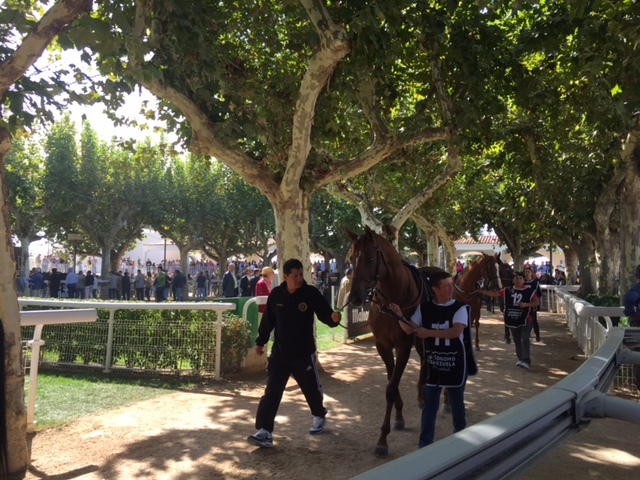 and a French-bred filly by Planteur for 14k. 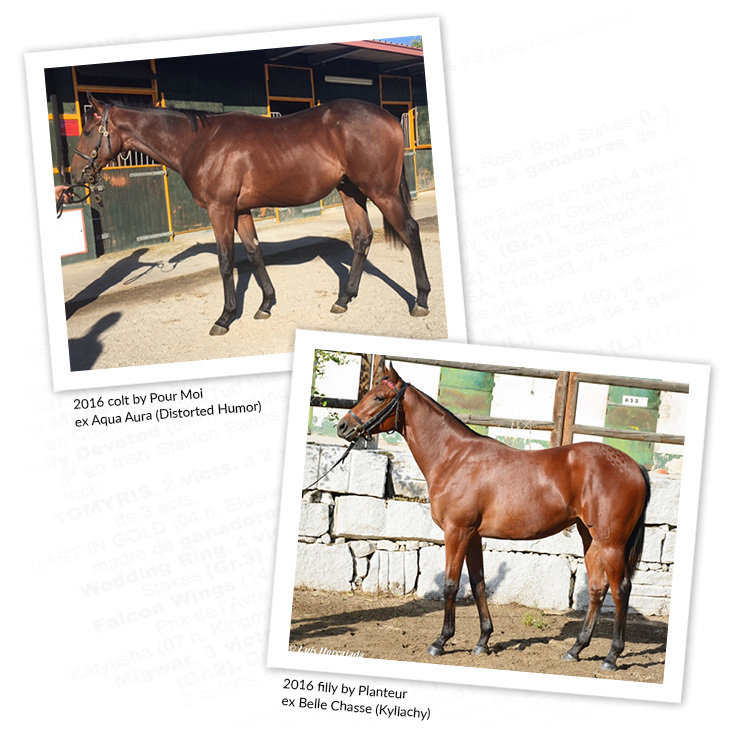 They are both attractive, good-moving yearlings who would no doubt have made 35k.+ and 30k.+ in England, Ireland or France. They travelled home well, arriving here in great shape but a little weary, after stopping in San Sebastian and Normandy on the way. They are both lunging sensibly with rollers on and may have a jockey on in a weeks’ time. Yearlings from this sale qualify for a Sales race back at La Zarzuela next September and they both look the type to run around that time and then develop into lovely 3yo’s. They are both currently FOR SALE! The racecourse is a seriously good track with wide sweeping turns and a long straight. From attending the races on the Sunday, it was obvious that you need stamina there, while the surface and the grass was in tremendous condition, far better than what we have experienced at San Sebastian in recent years. Of course, a trip like this could not be all business and Sophie and I did get a chance to get into “Viejo Madrid” with its fabulous buildings and fine Tapas bars, all part of our education. Let’s hope these yearlings prove a success and ‘punch our ticket’ for a return trip! Friday 29th September was Jerry Walsh’s last day at work for the Webber family at Cropredy Lawn. Jerry has been here for 13,149 days (36 years). We have appreciated and eulogised about Jerry and will be forever grateful for his dedication and loyalty, as we are to all our amazing staff, for evermore. I’ve said enough and far better to read this lovely piece written by one of our owners, Gordon Simpson. Jerry hangs up his tack one last time – after 36 years and a million miles! When Jerry Walsh reported for his first day’s work on September 19, 1981, he never imagined for a moment that Cropredy Lawn would become the focal point of his racing career for the next 36 years. Life was very different then. Margaret Thatcher was Britain’s first woman Prime Minister (well, not so much has changed! ), Harrison Ford was on the cusp of becoming a global icon as Indiana Jones and the great Derby winner, Shergar, was still oblivious to the horrific fate which awaited him. But, alongside the inevitable racing certainties of death and taxes, we can also add retirement. After more than three and a half decades in the employ of the late John Webber, and now his son, Paul, the current master of Cropredy Lawn, Jerry has finally hung up his tack for the last time. Jerry was, quite rightly, lauded during the 2017 Owners Day for Paul Webber Racing on Sunday, September 10, just nine days before this soft-spoken and affable Irishman would have clocked up his 36th anniversary as travelling head lad. Woe betide anyone who enters the tack room at Cropredy and interferes with any of the vital equipment crammed into that warm, confined space which has been Jerry’s private fiefdom for 36 years. Now, though, the baton will be passed to a new generation of stable staff. It has been, he freely admits, a “heck of a journey”, one which has taken him to every corner of the U.K. and beyond, clocking up more than a million miles in the horsebox in the process. “I have actually driven a runner to every single racecourse in Britain,” revealed Jerry, now 65 and ready to enjoy the quiet life in retirement just 15 minutes away from Cropredy Lawn. “I never had a wish to visit racetracks for fun, on a day off or on holiday. I wanted to be there with a runner and to deliver them safely back home again afterwards, win or lose. I’ve been to Perth as the most northerly point and Newton Abbot in deepest Devon and loved every minute of it. I remember one van I drove which went ‘round the clock’ three times, so it had done over 300,000 miles by the time we got rid of it! Jerry came across the Irish Sea from County Cork with pretentions of being a jockey. He worked, first, for Jimmy Fitzgerald in Malton then Ken Bridgewater, father of trainer David Bridgwater, near Cheltenham. He had four winners, all for his ‘Guv’nor’, and all on a two-mile chaser, Old Chad. 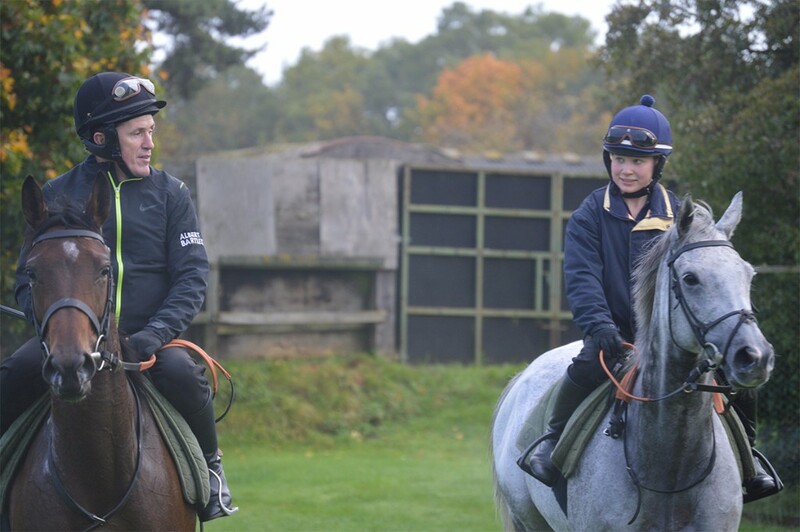 The highlight of that short career in the saddle still excites him. Those 36 years have provided Jerry with many exhilarating moments, most notably when Full House won at Royal Ascot, Kew Green trotted up in the Roseberry Stakes at Kempton, Australia Day and Time for Rupert showed flashes of true brilliance and Auntie Dot claimed third place in the 1991 Grand National at 50-1. Five years ago, Jerry was honoured with a Special Merit Award at the Godolphin Stud and Stable Awards in London. The testimonial said it all: ‘for unwavering dedication and contribution to the racing industry’. 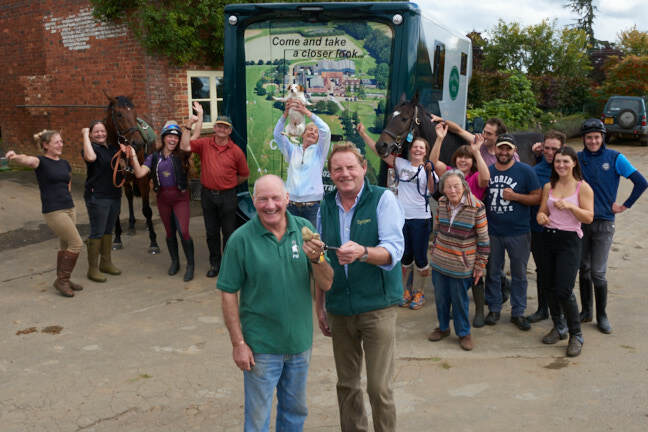 Presenting Jerry with a magnum of champagne in front of appreciative owners, friends and family at Cropredy Lawn, Paul Webber paid tribute to his travelling head lad. He said: “Jerry has always managed to remain cheerful no matter what problems we’ve all faced. So, at long last, Jerry can work on reducing his golf handicap from 28 – “Never had much time to play!” – and enjoy a happy and rewarding retirement with Pauline, son Alan, daughter-in-law Charlotte and the grandkids. Have fun, Jerry. You deserve it! With the Autumn leaves beginning to gently tumble and grass holding more moisture from the heavy dews, all trainers start prodding the ground in their schooling fields, in the hope that the ground is safe enough to start schooling the October and November runners. This is a terribly dangerous and nervous time of year for trainers and owners alike. 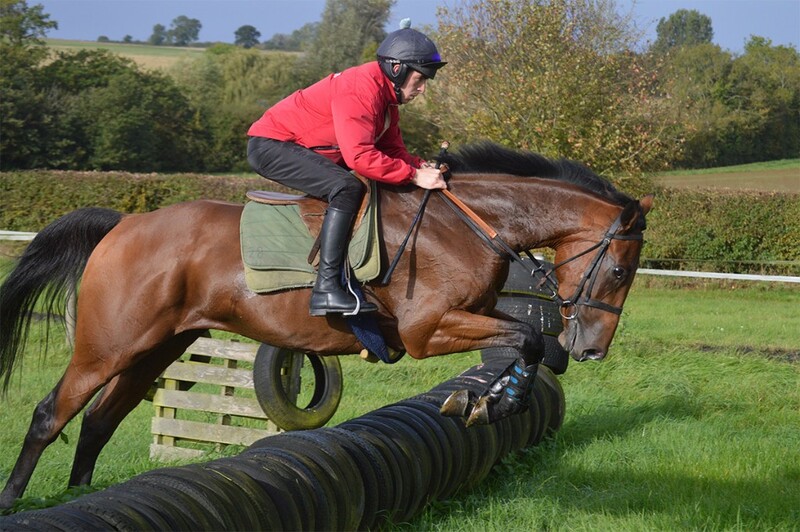 The horses are beginning their faster work in the hope that they are getting closer to their seasonal debuts. We all venture off around evening stables with a little fear of what we may discover after the increased stresses of morning work. A little unusual heat here or a very slight swelling there set alarm bells ringing and a horrible tightening and sick-making feeling in the stomach grips you immediately. 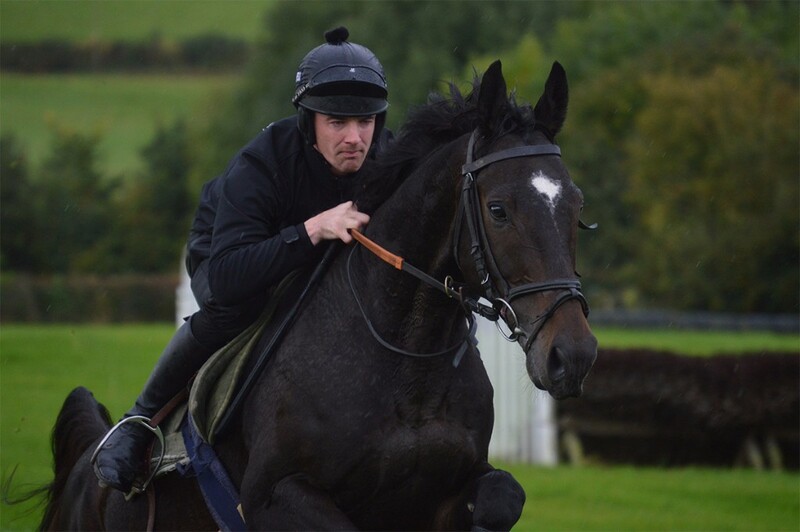 We were blessed on Saturday morning by perfect ground, lots of attending owners and jockeys riding out of the calibre of Tom O’Brien, Gavin Sheehan and that retired fellow A.P. McCoy. We got plenty done with Tom schooling his usual rideBREATH OF BLIGHTY, Gavin renewing his acquaintance with COSMIC DIAMOND and A.P. getting to know Mr. McManus’ pair,YOUKNOWELL and the unnamed JEREMY 4yo gelding. It was so good to have all these talented fellows here and there was a real buzz about the place as preparations had moved up a notch towards the proper N.H. season. We had about twelve owners with us through the morning who all loved quizzing the assembled jockeys and all our team about the prospects that lie ahead. Let me mention that those owners deservedly devoured over thirty sausages and towers of Ku’s scrambled eggs that originate from her own ‘Very Special Ladies’! There was “BAKE-OFF” mania around here last Friday as Gail Peacher organised a Macmillan Charity Cake-making competition. 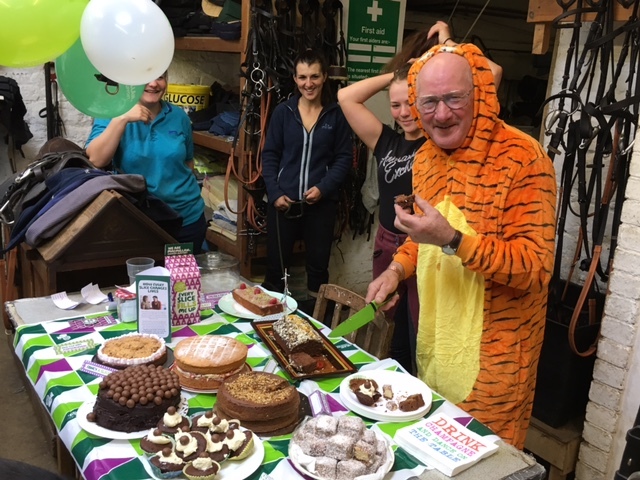 As this was Jerry Walsh’s last morning he was ‘press-ganged’ into judging the cakes while dressed in the most fetching Tiger ‘onesie’ outfit. Jerry had a very tricky task and after eating plenty of each presentation gave first prize to Suzanne’s Victoria Sponge. Gail and The Team raised over £125, a great effort. 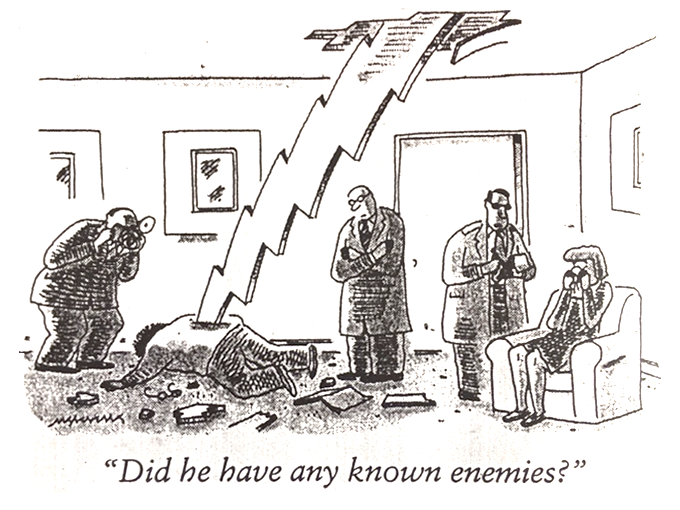 Just a seriously brilliant cartoon from The New Yorker to share with you!